Get the ASE testing experience and smooth out all the kinks before you take the actual exam. 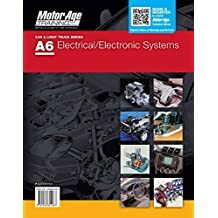 Our A6 free practice test features sample questions covering the ASE car and light truck extensive electrical/electronic systems, battery, starting systems, charging systems, lighting systems, gauges, horn, wiper/washer and power accessories diagnostic information, including symptom descriptions and their causes. The multiple choice practice test questions simulate real life situations and examples that mechanics will run into on test day and on a daily basis. Get an idea of what to expect on the exam and be ready on test day.